When a veterinary surgeon performs an equine dental examination the teeth and skull are examined for any over growth and abnormalities. The overall aim is to provide a grinding surface that the horse can effectively use to perform the first stage of the digestion process. Effective chewing or ‘mastication’ is very important as the high fibre and cellulose feeds horses eat require considerable breakdown and mixing with saliva before it enters the stomach. If the horse is unable to do this effectively then it will not be able to utilise the nutrients and calories of the feed. In extreme cases the mouth may be so distorted that the horse will not be able to chew at all, this often is noticed when the horse begins to loose weight and drop feed (quidding). 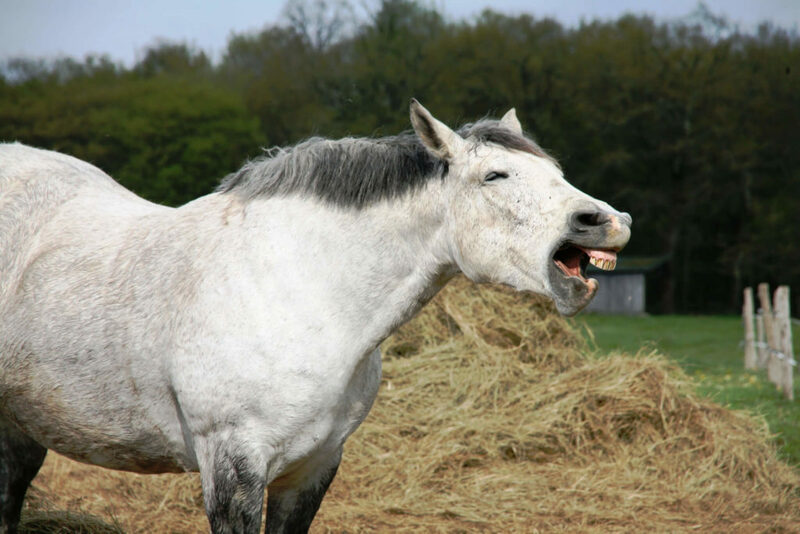 Sharp edges and hooks are the most common problems seen in the equine mouth. These are identified by placing a haussmann’s gag onto the horse to hold the mouth open to enable examination. They can be easily felt and seen and will require removing. Depending on the size and location either hand rasps or highly developed electrical dental equipment will be used to reduce the size of the abnormalities. These problems can frequently lead to ulcers developing in the horses mouth which can be painful, reduce performance, stop the horse eating and make the horse head shy. More complex problems such as a wave mouth, steps and shear mouth may require frequent treatments and if left untreated may lead to serious discomfort. Horses normally cope surprisingly well with dental treatments and it is normally a stress free routine procedure. If you would like to discuss the specific dental needs of your horse please do not hesitate to get in contact with one of our vets. I have found the Shotter and Byers vets, who have been looking after my horse for a long time now, to be extremely approachable, friendly and sympathetic whose knowledge and expertise I’m sure every other livery who knows them would agree, is very reassuring. Particularly to those of us who might be described as a little overprotective/OTT? The staff who man the phones and do all the other things which keep everything running are always courteous and helpful, even to those who have a red “totally mad??? sticker on their file and I have no doubt that includes yours truly. We would never use a different vets practice since using Shotter and Byers. David has been nothing but honest, professional and thorough throughout the time we have been with the practice. He treated our pony who suffered from a catastrophic tendon injury from the very beginning and tried everything we could for him before deciding together that it was the kindest thing to let him go to run free. A big thank you to the whole team as poor Chester saw a large majority of the vets during all hours of the day and night and so he became a well known patient! The whole team was so supportive until the very end. Thank you again!